Meadows are ablaze with blossoms of goldenrod, one of the most attractive native perennials offering nectar and pollen to a wide variety of beneficial insects. This year has been particularly favorable for several species of paper wasps and many are to be found visiting goldenrod in fall. 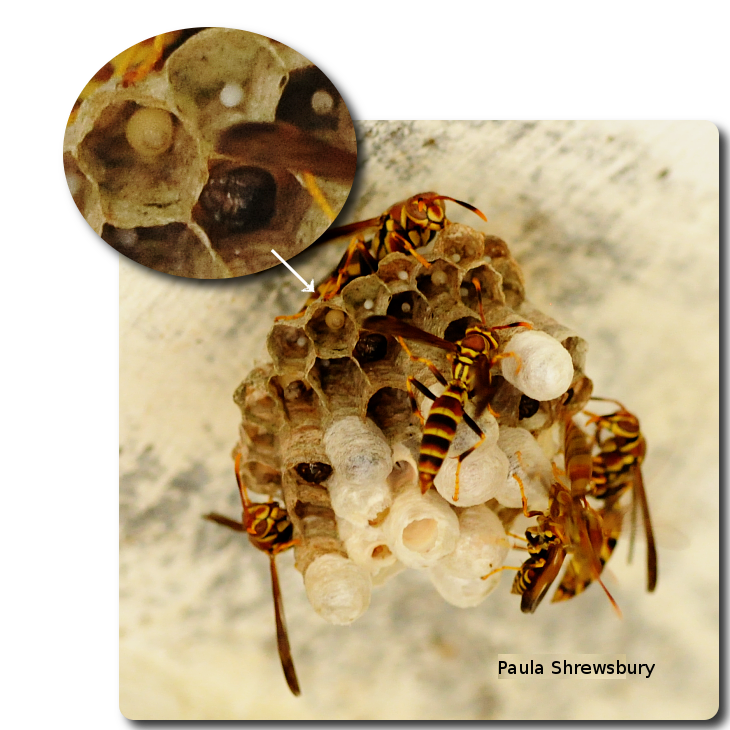 While adult wasps are often seen gathering nectar on flower heads, nests of paper wasps are typically located beneath overhangs of houses or sheds or in other protected locations. Each nest is initiated in spring by a female called a foundress that survived the wicked winter in a sheltered spot perhaps beneath the bark of a tree or behind a loose piece of siding. In spring, the foundress uses her powerful jaws to gather wood fiber from trees and shrubs. She chews it into pulp and molds the pulp into papery cells. The enlarging nest is shaped like a parasol and suspended by a narrow stalk called a pedicel. After the first few hexagonal cells are constructed, the foundress deposits an egg within each chamber. Eggs soon hatch into legless larvae. Her youngsters have healthy appetites and the queen gets busy hunting food for her babes. Caterpillars are one of the favorite items on the menu of paper wasps, thus, paper wasps are our allies. By capturing many caterpillars, paper wasps reduce damage to our valuable crops and landscape plants. After subduing its prey, the paper wasp uses its jaws to slice and dice the victim into a spongy ball. The caterpillar ball is transported back to the nest where hungry mouths await. A high protein diet of fresh caterpillar meat helps small wasp larvae grow rapidly. Not all potential foundresses are successful in establishing a colony. Some may join an established nest where they assist the resident foundress in caring for brood. These subordinates forgo their right to produce young of their own. If some do attempt to lay eggs in the nest, the dominant foundress will find her competitor’s eggs and eat them. Tyranny rules the paper wasp nest! The colony grows as summer progresses and more than a hundred workers may be produced. With the approach of autumn, production in the colony shifts from making workers to making future foundresses and their mates. The new queens and kings that emerge from their cells are a rather lazy lot and spend little time helping with the care of the colony. As workers return to the colony with food for developing larvae, the petulant royals steal and eat the meals. With no more workers being produced and food being diverted to hungry adults, the colony declines. Future foundresses leave the nest to mate and seek protected hibernal refuges. Because of their beneficial nature, paper wasps and their nests should be left alone whenever they do not threaten humans or pets. If a foundress starts a nest in a location where people are likely to be stung, it can often be eliminated from a distance with a strong stream of water from a garden hose. Early autumn is a fine time to visit the meadow to observe paper wasps and other interesting beneficial insects on a sunny day. Two marvelous references “The Insect Societies” by E.O. Wilson and “Biological studies of Polistes in North Carolina (Hymenoptera: Vespidae)” by R.L. Rabb were used in the preparation of this episode. To learn more about paper wasps, please visit the following web sites.